It is important to treat the guys who make up the groomsmen! Your hubby has chosen these men to stand by his side as he marries the love of his life, his queen, and his number one fan. Though you may be dreaming of standing next to him in your beautiful wedding dress, right now he may need some help in choosing their gifts. To help you out, our bridal store in Denver has collected three popular groomsmen gifts that groomsmen will actually use. 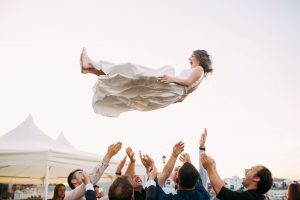 Read this blog for Etsy-infused inspiration, and be sure to visit us and our expert bridalistas if you have yet to find your dream wedding dress. These are some of the most popular groomsmen gifts that we found on Etsy! Whether you want to give the groomsmen a small personalized gym bag, monogrammed cufflinks, or a money clip, there are so many online shops that will have you covered. The personalized gym bag or weekender bag can have either their initials or last name on it, and you can choose from a wide array of colors and fabrics. If your wedding is going to have them away from home for a bit, this bag will be especially useful. They can pack all they need for the romantic weekend while still looking stylish, and when they get home, they’ll have a gym bag or weekender bag they’ll use all year. Monogrammed cufflinks are always a great idea! You’ll love the groomsmen’s style being consistent while you’re all walking down the aisle — you in your beautiful wedding dress and them in their suits that match right down to the cufflinks. And the groomsmen will love having some extra personality in their outfit, and they’ll love having a personalized accessory for next time they’re dressing up for a more formal event (be it a work event, party, or another wedding in Denver). Whether made of metal or leather, money clips are also great groomsmen gifts! Many men are absolutely loving lightweight money clips these days — walking around is easier without a giant wallet sticking out of their pocket. A personalized money clip is one of those items that someone generally doesn’t indulge in for themself, so when you and your fiancé give this useful present, the groomsmen will think of your special wedding day each time they use them. The friendship between a groomsman and groom is important! A groomsmen gift is a special, personalized way for your groom to say thank you to some of his best friends, and when you help, you can help support the friendship that you’ll enjoy for many more years. 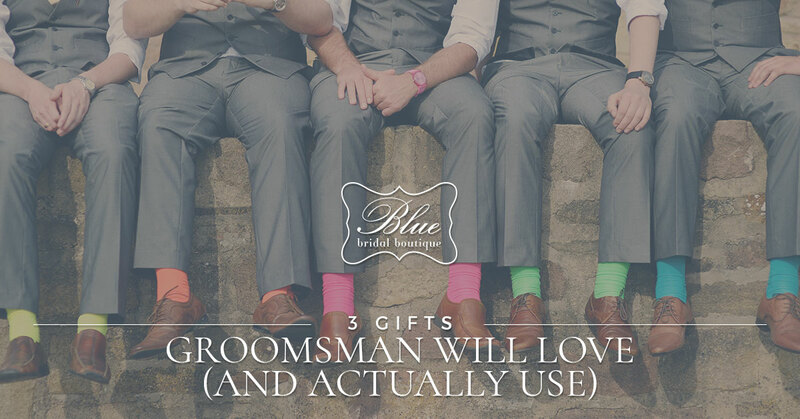 No wedding is complete, of course, with only groomsmen gifts. You need a wedding dress! If you haven’t crossed this all-important item off of your list yet, then visit Blue Bridal Boutique right in Denver. We have everything from mermaid wedding dresses to princess wedding dresses, from modest wedding dresses to the backless wedding dress of your dreams — and all from top wedding dress designers. We also have bridal hair accessories, wedding jewelry, and bridal veils you’ll fall head over heels for. If you’re in the Denver area and are shopping for a wedding dress, we can help. Schedule an appointment at Blue Bridal Boutique and enter to win a free bridal veil today.